With the string of chemical-weapon terrorist attacks on various targets in Japan in early 1995, a theoretical scenario has become real. Years of discussions, debates, and contrasting assessments on the possibility of terrorist organizations’ use of non-conventional weapons for mass murder ended the moment the toxic gas Sarin began wafting through the tunnels of Tokyo’s subway system. Many scholars who have studied terrorism agree today that it is only a matter of time, now that the Supreme Truth cult in Japan has paved way for others of its ilk, until other such groups use non-conventional weapons on their attacks. Modern history abounds with examples of terrorist organizations on one side of the globe that mimic a modus operandi and weapons that have proven themselves on the other side of the globe. A nuclear terrorist attack is an incident in which a terrorist organization uses a nuclear device to cause mass murder and devastation. Nuclear terrorism also includes the use or threat of use, of fissionable radioactive materials in an attack, an assault on a nuclear power plant for the purpose of causing extensive and/or irreversible environmental damage. In this last case, the terrorist organization need not develop, acquire or gain control of a nuclear bomb in order to cause extensive damage. It need only use conventional weapons against one of the many nuclear reactors in the world, seriously damage the reactor, and thereby release radioactive matter into the atmosphere in such a way as to endanger large population centers. Nuclear weapons can give terrorist organizations considerable advantages, principally because they can inflict large numbers of casualties and command worldwide media attention. Moreover, because it is hard to judge a terrorist organization’s threats to use nuclear weapons, Western countries may soon find themselves susceptible to terrorist blackmail under threat of a nuclear strike and find themselves ensnared without knowing how likely the terrorists are to carry out their threat. A terrorist organization may attempt to obtain fissionable material or a nuclear bomb in a number of ways. It may purchase fissionable material on the black market that has developed in Eastern Europe and elsewhere following the disintegration of the Soviet Union, the economic crisis that has gripped most of the FSU, the demoralization of the Russian army, and the deterioration of governmental control of radioactive material and nuclear bombs in some of these countries Black-market commerce in radioactive material has become a very real menace. There are daily disclosures of attempts to smuggle equipment and fissionable materials for building atomic bombs from various countries Among others , those involved in these attempts include terrorist organizations, Third World countries, economic players, and local mafias. According to the German weekly Der Spiegel, German intelligence reports that the black market has been flooded with radioactive substances such as enriched uranium and that 124 transactions in such materials have been discovered around the world. Western intelligence concurs that the traffic in radioactive substances has created a real danger of atomic weapons reaching irresponsible hands that may use them for blackmail and attacks. CIA Director William Studeman, in testimony before the House Judiciary Committee on the subject of international terrorism in April 1915, noted that the most serious threat of nuclear terrorism is the use of materials or components that are currently stockpiled in the republics of the former Soviet Union. A terrorist organization may purchase or obtain a nuclear bomb from any country, particularly a country that supports terrorism. Many "revolutionary" states in the Third World such as Iran, Iraq, and Libya are known to be actively and regularly assisting various terrorist organizations. These same states have reserved considerable resources and made massive investments in the acquisition of nuclear capability, and are striving to develop or purchase an atomic bomb, making it only a matter of time until these countries attain their goal. 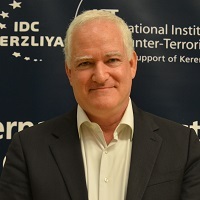 The intimate relations of some of these countries with terrorist organizations make it possible (although perhaps unlikely) that one of these countries will provide atomic weapons to one of the organizations that it patronizes in order to further its international interests by means of this organization. A terrorist organization may construct a nuclear device by using scientists who belong to it or by acquiring know-how and hiring scientists on the black market. It is rather unlikely that a terrorist organization would itself construct a nuclear bomb, for this requires special resources and training that terrorist organization do not possess at the present time. However it is worth bearing in mind that many unemployed nuclear scientists are available on the world market, having been discharged in the FSU, and are willing to sell their professional expertise and experience to the highest bidder. With proliferation of nuclear reactors worldwide and, consequently, the proliferation of nuclear experts, it is theoretically possible for a terrorist organization to purchase the service of nuclear experts and, with the assistance of a friendly country (that would give it the resources and facilities it needs), develop a nuclear bomb. Terrorists may even seize a nuclear stockpile, one of the many stockpiles of various nuclear devices and other hazardous substances around the world. The European powers alone possessed about 50,000 nuclear bombs and warheads in the mid-1980s. This vast nuclear arsenal is an attractive target for terrorist organizations in many countries and requires massive outlays to protect each and every nuclear bomb and site. The fear of capture of a nuclear bomb by a terrorist organization is not unrealistic. Maps and drawings of American nuclear storage facilities in West Germany were found in the possession of Red Army faction activists who had been arrested in West Germany in the early 1980s. When interrogated, the detainees admitted that they had been gathering information on the facilities for the purpose of attacking them and appropriating their nuclear weapons. According to a report by Russian intelligence in early 1993, there have been about 150 incidents over the years in which terrorist organizations have attempted to steal fissionable material, attack and damage nuclear research facilities, and murder or kidnap officials or scientists dealing with atomic research and development. The world community and, especially the great powers are aware of the danger of acquisition of nuclear weapons by terrorists. To avert the menace, several bilateral and international cooperative efforts have been made Thus, the inaugural conference of the Nuclear Control Institute (set up in the United States in the mid-1980s and staffed by nuclear experts and scientist from various countries) resolved that the possibility of nuclear terrorism must be recognized. In 1986, American and soviet representatives discussed the possibility of theft of nuclear weapons by terrorists and reached the conclusion that "danger detection centers" should be set up that would facilitate rapid response if and when the problem arose. In 1993, the defense ministers of the NATO countries discussed the issue of nuclear terrorism and decided to set up a committee of experts to look into it. Thus, terrorist organizations have various options for obtaining nuclear capability or a nuclear device. It is important to remember that terrorist organizations usually lack moral scruples and do not fear a nuclear response or damage to their international interests as a result of using nuclear weapons (a fear that has deterred sovereign states from using weapons of this kind in war and peacetime). All these factors make terrorist organizations more dangerous in nuclear terms than sovereign states. In contrast to nuclear terrorism, which remains a problematic and complex matter to carry out and is therefor still largely theoretical, chemical terrorism is more concrete and practical, and in several instances has already been used. The most conspicuous chemical terrorist attack occurred in early 1995, when members of the Supreme Truth cult in Japan released toxic gases in various targets, particularly the subway systems of Tokyo and Yokohama, injuring dozens and killing several. Fortunately the number of victims did not reach higher proportions despite the high toxicity of the material released and the panic that gripped the subway passengers and caused a stampede from the sites involved. This was the first time an extremist organization had attempted to use a chemical substance in a mass terrorist attack. It was not, however the first use of chemical agents by terrorist organizations in order to instill terror, carry out blackmail, or cause large scale economic damage to their rivals. In several cases, various organizations in different parts of the world have laced food products on order to sabotage marketing if them and terrorize consumers. This was the case with citrus fruit exported from Israel to European markets in which a chemical substance was injected in order to cause economic damage to Israel. In another case, a toxin was injected into a chocolate confection in Japan in order to blackmail the manufacturers. In 1991, a toxin was found in jars of baby food in Israel. Accordingly , chemical terrorism may be divided into two main types: 1) Attacks meant to cause mass devastation. In these cases, the terrorist organization releases a toxin in congested population centers, bodies of water, and unventilated areas in order to create as many victims as possible. 2) Chemical attacks meant primarily to terrorize, blackmail, or cause economic damage- a specific attack in a particular product (particularly a food product, mainly by introducing a toxic chemical substance into the product itself). For the organizations involved, chemical terrorism has several clear-cut advantages over conventional or nuclear terrorism. First of all, chemical substances are more accessible and available. They can be manufactured using simple chemical processes known to any university student. The components are usually simple products that can be obtained in the free market without restrictions. A chemical attack can be perpetrated using off-the-shelf pesticides sold in grocery stores. If this were not enough, many countries (including Third World countries and known supporters of terrorist organizations) have large arsenals of chemical materials. Therefore, one must reckon with the possibility of transfer of chemical weapons (unlike nuclear weapons) from one of these countries- particularly those that have not flinched from using chemical weapons against their own citizens and in their wars with neighboring countries- to a terrorist organization in order to perpetrate attacks. Chemical terrorism is inexpensive and does not require extensive facilities. Because toxic chemical substances are ordinarily quite expensive to purchase or manufacture (at least when compared with nuclear substances), resource -starved organizations can obtain and use them very easily. Chemical substances have the advantage of mobility. In contrast to a nuclear bomb, which is usually large and cumbersome and requires special vehicles and security in transport, small amounts of chemicals suffice for a chemical attack. For example a jar containing several hundred grams of a chemical substance may cause mass mortality and, of course, can be moved about easily, with no need for special preparations or security. Over the years , modern technology has made great progress in the detection of conventional weapons and explosives. Many countries have put this technology to practical use at sensitive facilities and in congested population centers. The technology for the detection of chemical substances, in contrast, has not been disseminated as widely and has not been used for preventative security in the foiling of terrorist attacks. This facilitates the terrorist’s work in delivering chemical substances to their targets and concealing them there with very little chance of prior detection. A massive chemical terrorist attack has a very wide field of impact. The dispersion of a chemical substance in a congested area may cause many casualties. However, beyond the grave physical damage caused by exposure to the chemical substance, an attack of this kind may cause many additional casualties because of citizen’s panic and attempts to flee the disaster site. Moreover, a chemical terrorist attack, for the very reason that it involves a non-conventional weapon, will inevitably trigger a serious crisis of morale and undermine the personal security of the citizens of the country attacked. In this context, it should be borne in mind that most chemical weapons are colorless, odorless, and devoid of any other identifying factor. Therefore, they cannot be detected until the moment citizens are exposed and experience symptoms. Furthermore, it is difficult to protect oneself from chemical substances and prepare for their eventuality. This aggravates the morale problem. CIA Director Studeman further warned that terrorist organizations throughout the world would adopt chemical weapons such as those used in the Tokyo subway attack. Biological terrorism is the "use and dissemination of biological weapons (various kinds of microbes) in population centers, by various means, in order to cause morbidity and numerous causalities." Unlike the tools of chemical terrorism , biological weapons were not designed and ordinarily cannot be used for pinpoint attacks; their principle purpose is mass devastation. The results of a biological attack are not immediate: they become apparent several hours or days later (after some of the victims have left the site of the attack). This may make it harder to detect the perpetrator and target of the attack. Biological weapons are not as common, accessible, and available as chemical weapons. For a terrorist organization, the two main sources of biological weapons ate home manufacture and acquisition or purchase from sovereign states. Homemade biological weapons require the use of sophisticated biological laboratories and resources of diverse kinds, which, on the whole, are not available to terrorist organizations. However various countries (particularly those that are unable to obtain nuclear weapons) have stockpiles of biological and chemical weapons. Under certain circumstances, some of them may deliver biological weapons to terrorist that enjoy their patronage for the purpose of attacks. Once a terrorist organization has succeeded in obtaining biological weapons, it can move them from place to place very easily (as it can with chemical weapons) and without fear of detection. Similarly, the weapon can be transported to the vicinity of the target and, if necessary, concealed there until used. According to Western intelligence, international terrorist organizations are aware of the considerable advantages of non-conventional weapons, and some of them are making strenuous efforts to obtain chemical and biological devices. In early 1989, US Secretary of State George Shultz spoke in this matter in Paris, at the opening of the international conference on the banning of chemical weapons. The terrorist organizations, he said, are unlikely to resist the temptation to use chemical weapons without prior warning in order to attract political and media attention in a dramatic way. Some terrorist organizations seem to have already prepared for the possibility of using non-conventional methods. According to British and American media, Palestinian and Iraqi terrorists were trained in the early 1980s at a special facility of the East German secret police (Stasi) near Berlin in poisoning water sources (rivers, wells, and surface reservoirs) and in using biological weapons and toxic gases. According to one of the German instructors who worked at the facility, the terrorists were trained in the dispersion of microbes in congested locations such as airports and railway stations. According to the media sources who exposed the affair, the training facility for the poisoning of water sources was relocated from Germany to Iraq in the mid-1980s, and German instructors continued to work there. 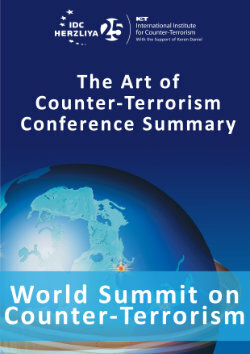 The West must gird itself for the possibility of the onset of a new phase on the actions of the world terrorist network: the non-conventional phase, characterized by the use of non-conventional weapons for mass killing and devastation, or the threat of using these weapons for blackmail or the attainment of other political goals. The world community must recognize the gravity of the threat and take measures today to contend with it. Appropriate measures would include tougher control and inspection of non-conventional weapons, a ban on the unrestricted sale of raw materials for chemical weapons, and an airtight international boycott of all countries found to be responsible for delivering non-conventional weapons to terrorist organizations. In addition, technology should be developed to trace non-conventional substances, neutralize them and provide suitable and swift antidotes for the victims. The Western nations must recognize the menace at the door and begin cooperating more effectively in the war against terrorism in general, and in the inevitable confrontation with non-conventional terrorism, in particular.